Yesterday was April 12, 2011, and as far as I know mainstream support for SQL Server 2005 ended. See Aaron Bertrand’s A Quick Note About SQL Server 2005 Mainstream Support. Q. How long will my certification be valid? But that’s just the exam, I’m not too sure about the certification. In any case it really doesn’t matter at all. I mean, the skills a person has with SQL Server does not diminish or become obsolete with the expiration of SQL Server 2005. SQL Server 2008 and other versions are still alive and kicking. Bad News: So my MCTS (Microsoft Certified Technology Specialist) certification for SQL Server 2005 expired yesterday (don’t worry I’ll get over it). Good News: My MCTS certification for SQL Server 2008 takes effect last Friday when I passed the 70-433 exam (yaay!!) It’s my first step towards a new certification for myself, the MCITP (IT Professional). I found at least four typos in the questions and at least once I had to answer the question they meant to ask not the question they actually asked. Two thirds of the way through the exam, there was a power outage. No one could have foreseen it, but I was glad to discover that my questions weren’t lost and the time without electricity was not on-the-clock. I did well in every section except one, Working With Additional SQL Server Components. In that section I got two questions correct out of six. I guess I should have given more focus to it while studying. To be honest, I didn’t actually work the plan I wrote out for myself for that section. I had heard scary things about some of the other sections and focused on them. But even so, two out of six is pretty rotten for a multiple choice test. Random guesses might have even fared better. 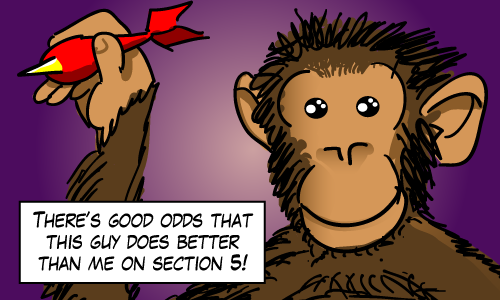 A lucky monkey has a good chance (46%) of doing at least as well or better than I did simply by throwing darts randomly as a strategy for choosing answers. what’s the syntax for fill factor? What’s a structured vs semi-structured column? Create DDL trigger that returns data. error handling, look at Rusanu’s service broker scripts, he’s an awesome error handler. Write a query that uses grouping sets. manage collations? how can they be managed. without checking syntax, shred xml. what’s the difference between xquery and xpath? Run through DTA, Prepare a workload <– remember options in DTA here!!! Thanks for this. Added to my bookmarks for when I hopefully go after my own certification one day. Congrats on yours! Thanks Aaron! There are a number of tracks for these, I’m doing the db developer track. If you’re doing the DBA track then there’s an excellent study guide (same sort of deal) done by Buck Woody. I’ll link to that one when I’m back at my desk. Congratulations on the passing of an exam 70-433. Congrats Michael and thanks for the test prep info. Dude, you rock for sharing this information. I always enjoy primers like this and wanted to thank you for allowing those with the predisposition to utilize! Congrats on passing as well. Dude, no YOU rock. Thanks for the comment. Maybe You can help me out to find some article on the Internet? P.S. Congrats with your achievements! This is terminology that Microsoft used in their page describing “skills measured”. Google’s topic on that is here: http://en.wikipedia.org/wiki/Semi-structured_data. They describe Semi-structured by contrasting how it’s different than structured data. As implemented by Microsoft SQL Server, semi-structured fields have XML types. Everything else is structured. What do you recommend? Should i go for the 2008? or the 2012? I have to definitely recommend the later ones. Technically, you’re weighing a choice between “SQL Server 2008” and “SQL Server”. You’ll notice that there’s no date associated with the last one. My SQL Server 2008 certification expires when the product expires. The SQL Server certifications that were introduced this year are not connected with any particular version, but need to be renewed after 3 years (I believe). So to answer the question as you asked it, go for the 2012 certs. I am planning to sit in 70-433 exam, if anyone like to share Transcender or SelfTest prep material then pls email me.